That statement said Minister for Natural Resources and Labour, Dr the Honourable Kedrick D. Pickering (R7) was on sight to examine the area and consulted with the Ministry and the Department of Conservation and Fisheries personnel as preliminary investigations show indications of low oxygen levels in the pond. 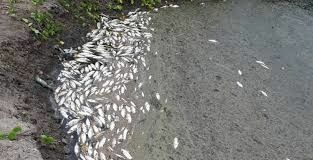 Honourable Pickering said, "There appears to be very low oxygen levels in the pond water which may be as a result of the high algae concentration; this may also be the result of the high temperatures due to climate change." High inland water temperatures can decrease the abundance and distribution of wild fish stocks in ponds by reducing the water quality. However, the most significant contributor of change in inland aquaculture and fisheries is floods and droughts that result from increasing seasonal and annual variability in precipitation. Climate change is already beginning to affect plants and animals that live in freshwater lakes and ponds, altering their habitat and bringing life-threatening stress and disease. Freshwater fish species adapted to cold waters are particularly vulnerable to warming as they experience unfavourably high temperatures. She added, “Climate change is happening so fast that many species are struggling to cope with the effects, as we have been seeing recently, many of them are at increased risks and the results can be very disturbing." The Department of Conservation and Fisheries will be testing the water at the pond and a further update will be provided. The Ministry of Natural Resources and Labour will continue to seek to ensure that the environment on which we depend are managed in a sustainable manner for the greatest possible benefit of the people of the Virgin Islands. Absolute bs. Perfectly natural occurrence. Of course the filling in of ponds doesn’t help any but these moo moos know everything. Let’s blame trump too. Allowing those boulders on the right side of the beach has Stopped the natural water from entering the pond normally. Yes, this pond drying out is natural, but the unnatural flow has been affected by those unneeded boulders. Government knew this many years now, said they would remove them, and didn’t. The problem could be solved right now if they wanted to, but they would rather talk nonsense about fast climate change. Struppes.